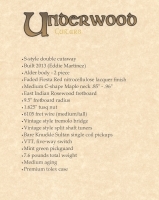 Offered here is a marvelous S-style instrument by Chad Underwood, "luthier to the rock stars." Chad hand-builds some really fine S and T style guitars and this example was built for famed session pro Eddie Martinez. All of Chad's guitars are special, but you can be relatively sure that examples like this one, built for a professional player, have been built with even greater care. 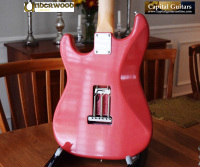 This beauty has an Alder body, with a faded Fiesta Red nitrocellulose lacquer finish and it weighs just 7.6 pounds (7 pounds, 10 ounces). 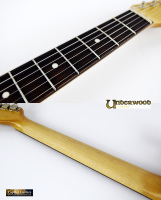 The one-piece Maple neck on this guitar has a medium/large C-shape, with depth measurements of .85" at the first fret and .96" at the twelfth fret. 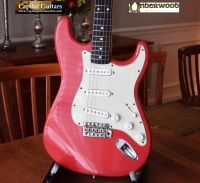 It has a lovely dark Rosewood fretboard, with a 9.5" radius, 1.625" Tusq nut and 6105 frets. 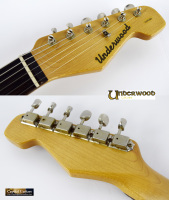 Chad uses Gotoh vintage style hardware for the trem bridge and tuners. 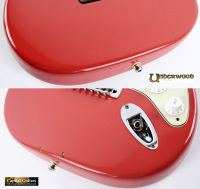 The electronics include a set of UK built Bare Knuckle Sultan single coils, along with traditional Strat-style controls (VTT and 5-way switch). 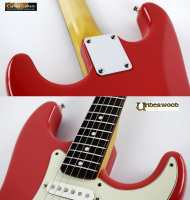 This guitar was built to feel, sound and play like a real vintage Strat (with modern updates) and that is exactly what it does! It is nicely resonant and the pickups sound superb. Please check out the short sound sample provided. This guitar can cook! Besides being a great luthier, Chad is also well known for the high quality of his aging work. This guitar has received moderate aging and it looks and feels incredibly authentic. The frets remain in great condition with tons of life left in them. This beauty comes in a very nice G&G tolex case with the trem arm and spec sheet. 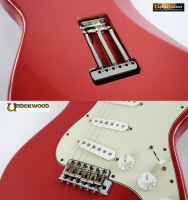 If a high quality Strat-style guitar is your thing (as it is mine), then you should give this marvelous Underwood guitar careful consideration. Chad's new guitars sell for upwards of $3,600. 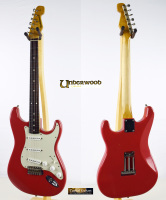 Buying this nice used example is much like getting a Fender Masterbuilt Relic for less than half the price!